Last year during the month of Ramadan, at the very moment that the Israel “Defense” Forces (IDF) were mercilessly pounding the Gaza Strip and elsewhere the group known as the Islamic State (ISIS) gained territory and carried out gruesome beheadings throughout Iraq and Syria, some of the most prominent Muslim citizens of America were gathering in the nation’s capital to attend the annual Iftar banquet at the White House. Iftar is the time in the evening hours during the holy month of Ramadan when Muslims break from fasting. 2014’s banquet, however, was shaping up to be a source of controversy even before the July 14th dinner took place. The year 2014 was one of great suffering and turmoil for Muslims the world over, with the bloody civil war in Syria in its forth and most deadly year with no end in sight, the rise of crazed demented takfiri groups such as Daesh (ISIS) who emerged and seized power over huge swaths of Iraq, Israel’s 51-day massacre of Palestinians in the Gaza Strip, deadly U.S. drone-strikes in Yemen, Pakistan, Afghanistan and Somalia, the ongoing persecution of the Rohingya minority by the government of Myanmar, and the continuing imprisonment and force-feeding of over a hundred prisoners-of-war at the U.S. prison-base GITMO located at (illegally occupied) Guantanamo Bay, Cuba. On top of that there were recent revelations that the NSA, FBI, CIA and NYPD had placed several prominent Muslim Americans under unconstitutional surveillance simply because of their religious affiliation. Being as how the drone strikes, the continuing existence of the Guantanamo Bay prison facility, the unconstitutional surveillance, and blanket support for Israel have all been hallmarks of the Obama Presidency, some members of America’s respective Muslim and Arab communities didn’t feel the timing was appropriate to be engaging in harmonious ceremonies with some of the very architects of these detrimental policies over a White House banquet. 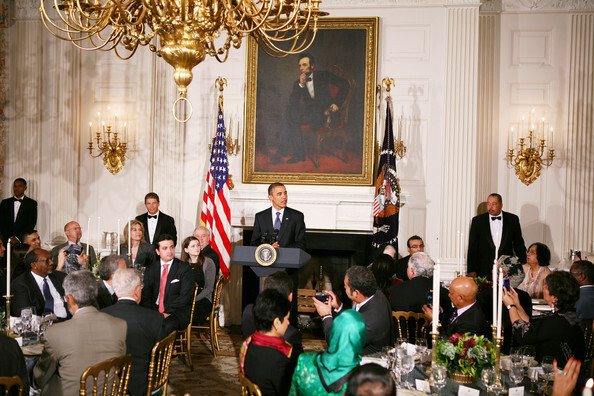 There was not unity across the board however, with the also-influential Muslim Public Affairs Council (MPAC) opting to attend the banquet under the impression that attending would “allow us to engage with senior White House officials for a decent amount of time on substantive issues”. That morning the White House Press Secretary Josh Earnest brushed aside calls to boycott the dinner and instead took the opportunity to try out some new talking points. Declining to address the legitimacy of the concerns raised, Earnest took a swipe at god-knows-which-countries when he stated that “unlike some other countries, the United States of America doesn’t target individuals based on their race or ethnicity or religion” – a bold-faced lie that the entire world can see through. The amount of cockiness with which Josh Earnest dismissed Arab and Muslim concerns was probably due to two different perceptions on the part of the White House: (1) that support for President Obama on the part of the minority Muslim community can be taken for granted and (2) that the Arab and Muslim communities hold little clout when it comes to the American political scene. Throughout the Presidency of Barack H. Obama, polls have shown American Muslims are one of the most consistently loyal constituencies the President has, second only to African Americans. A great deal of his level of support among them could possibly be due to their having emphasized with the President who, although a practicing Christian, has been time and again demonized as a Muslim by his enemies on the right, in a way which most often suggests that being a Muslim is a bad thing. They may also have looked upon him fondly as someone who, during a time in which great animosity was being whipped up against Muslims by the right-wing over the proposed Cordoba House during the 2010 mid-term election season, President Obama delivered a firm defense of their right to religious freedom and sounded a much-needed note of tolerance. Their power when it comes to influencing American politics is significantly less than that of other religious minority communities, however. They are generally not as well off economically as are Hindus and Jews, and due to distorted and racist media depictions of them, they face much discrimination in employment and are the least liked religious group in the country (right next to atheists, who practice no religion). Perhaps it was these circumstances that civil rights groups like MPAC had in mind when they decided it would be best not to turn down an invitation to dinner from the nation’s ostensibly most respected office. Why on earth, one wonders, would the President feel the need to restate America’s immoral, no-strings-attached support for Israel at a time when it was carrying out some of the most vicious crimes committed by either side in the nearly 70 year-old conflict? Isn’t the billions of dollars in lethal military weaponry and consistent abuse of veto-power to defeat related UN Security Council resolutions enough without having to stick it to the Muslims at a banquet supposedly held in their honor? What’s worse is that during the President’s speech, ambassador Dermer decided to take to his Twitter page and let his friends back home know that President Obama was reliable in towing the official line.
.@WhiteHouse for Iftar dinner. Appreciate strong statement there by President Obama about Israel’s right to defend itself. I guess we know then why his presence was necessary! With this kind of power imbalance, I think you have to assume you will be be played in any interaction with the ruling elite or their representatives. Yes, I know what you mean. But I can understand why some would want to attend as well, feeling that it’s one of the only moments they get to make their voices heard to the power elite, though I think boycotting was ultimately the better decision considering the monstrous human rights abuses of the NSA, FBI, CIA and White House. I think that all Muslims should boycott Obama anything. President Feckless pays lip service and that is the sum of our fears. Had not one single Muslims showed up, well, that would have made a statement that the Obama regime would be hard pressed to ignore. Junior Earnest is a psycophant and for the most part gutless.